TUESDAY JANUARY 26: Today in Thornhill, several Glencolton farmshare member were interviewed by a television crew for an upcoming program on TV Ontario (photo below). TVO will also be sending a camera crew to cover the Raw Milk Symposium in Guelph this Saturday, January 30th. TVO producer Liane Kotler interviews farmshare members at “The Blue Bus”. Mark McAfee flew in from California to Canada this week for the Raw Milk Symposium this coming Saturday and stopped by to chat today with the farmshare members as well. That’s Mark, in the photo below, signing the food rights declaration on the side of the Glencolton Farms truck. Mark met with the farmshare members together with his wife Blaine who will also be presenting at this weekend’s Symposium. Thanks to David Pickett for the photo. Mark runs a large raw milk farm and dairy in California and has been active in helping establish standards for raw milk production in the U.S. through the RAWMI organization. Four Raw Milk Heroes at the Vancouver Real Milk Food Politics forum on April 6, 2013. Great conference . Sold out . The energy is high. ( Right to Left) Alice Jongerden former agister of Home on the Range Farms, Jason Gratl ,(Lawyer for Our Cows , Chilliwack), Michael Schmidt , and Mark McAfee (largest legal raw dairy operation in California). 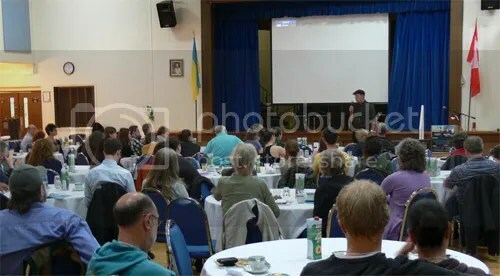 Click image for more photos on Facebook. Michael Schmidt at yesterday’s “Fresh Milk, Food Rights”. Click image for more photos. 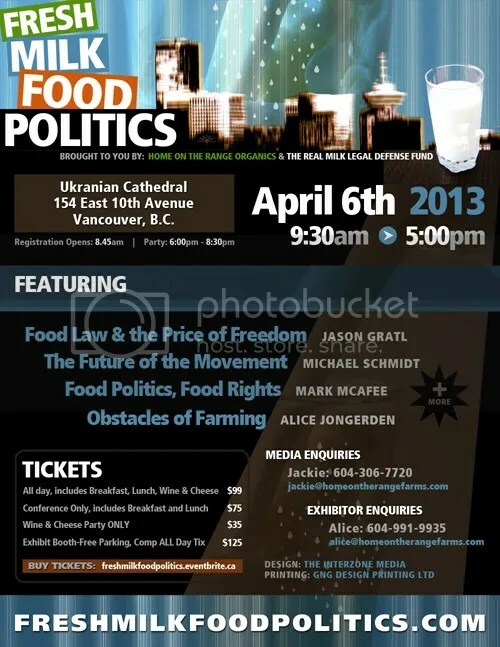 Fresh Milk, Food Politics, a one day conference, will take place on Saturday, April 6, 2013 8:45am -5:00pm at the Ukrainian Cathedral in Vancouver, British Columbia. Speakers and exhibits will cover a wide range of food issues. Speakers include: Mark McAfee, Alice Jongerden, Michael Schmidt, Halyley LaPalme, Karen Selick, Jason Gratl. Tasty local food will be served. To register call 604-306-7720 or visit freshmilkfoodpolitics.com. “In a bombshell revelation of the depth of the food police state that now exists in LA County, California, NaturalNews has learned that the LA County health department has unleashed door-to-door raw milk confiscation teams to threaten and intimidate raw dairy customers into surrendering raw milk products they legally purchased and own. 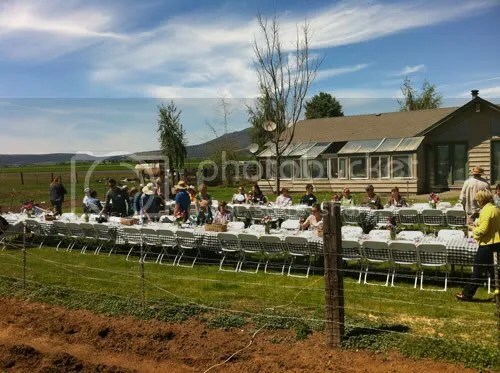 The table is set for guests at Windy Acres Farm in Oregon. It was a moment of surprise for Mark McAfee and me as we drove into the lane of Windy Acres farm. We weren’t blown away from the wind at Windy Acres Farm, we were blown away by the size, the complexity and diversity. This farm was run not by one or two or three men. This farm was managed by just one modest woman ready to take on the world for the” Right to Choose”.